March 21, 2007 - Producing the finest sweetened dried cranberries (SDC) is a science that Ocean Spray® has been working to perfect. From its fourth Craisins® line, which started up in May 2006 to its fifth line, scheduled to start up in the Spring of 2007 in Markham, WA, Ocean Spray relies on sanitary Smart Shaker® solutions from Key Technology. Key's versatile Iso-Flo® vibratory shakers convey sticky product on the packaging line and handle a wide range of functions on the processing line. "Our goal is to produce the thickest, juiciest, plumpest SDC we can, and Key helps us achieve that goal," said Bob Lowder, Manager of Capital Engineering and MRO Programs. "Key's willingness to customize equipment, and the expertise of their engineering staff have been instrumental to our success." Ocean Spray maximizes product quality and line productivity while producing 10 to 12 million pounds of SDC per year on each of its Craisins production lines. 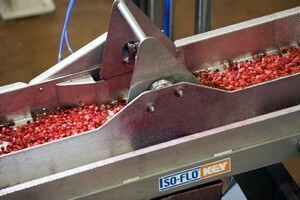 The Iso-Flo® vibratory shakers from Key do more than just convey product at Ocean Spray. While moving product between the units of operation that slice, extract, infuse, dry, and package, Iso-Flo shakers are used to clean, wash, dewater, de-syrup, size, and grade as well as convey. The cranberries have dramatically different characteristics at each stage - from frozen product at the start to hot, sticky product after the dryer - and each stage requires a unique solution to handling the challenging product. With Iso-Drive® frame-mounted drives and StrongArm(TM) spring arm assemblies, Iso-Flo distributes energy to the conveyor bed in a controlled natural-frequency operation. The low amplitude, high frequency movement minimizes product degradation and reduces maintenance. "For the new line going into Markham, we'll use Key shakers again," noted Lowder. "Their technology is clearly at the forefront and we couldn't be happier with them. But we are trying something new in Markham, too - we'll be installing Key's new laser sorter. After running two sorters side-by-side, we decided that Key's Raptor is the right system for us in this application." The new Optyx® with Raptor Laser Technology going into Ocean Spray's Markham facility combines Key's proprietary state-of-the-art color cameras and laser technology on one powerful sorting platform. Color sorting maximizes the removal of defects while laser sorting maximizes the removal of foreign material. Combining laser sorting with color sorting achieves unmatched product quality and optimizes food safety. "Ocean Spray uses state-of-the-art equipment to insure the highest product quality and product integrity. I know a lot of food and beverage companies talk about quality and integrity. But at Ocean Spray, it's much more than a message or a tag line. It's a way of life," commented Lowder. Key Technology, an ISO-9001 certified company, is a leading designer and manufacturer of process automation systems, integrated electro-optical inspection and sorting systems, and processing systems. Key® systems help processors to improve quality, increase yield, and reduce cost. With worldwide sales representation, the company maintains demonstration and testing facilities at its headquarters and manufacturing divisions in Walla Walla, Washington, USA, and at Key Technology BV in Beusichem, the Netherlands. The company's common stock trades on the Global Market tier of The NASDAQ Stock MarketSM under the symbol: KTEC. Vertical Sortation Unit suits baggage handling operations. Tilt-Tray/Cross-Belt Sorters utilize LSM technology. Carton Sorter processes 30-74 cartons per minute. Automation System accelerates handling of laser-cut parts.